This entry was posted on Saturday, March 29th, 2014 at 3:32 pm	and tagged with anthony ryan, blood song, blood song german version, raven's shadow and posted in Writing Stuff. You can follow any responses to this entry through the RSS 2.0 feed. « Blood Song in Hungarian is…. but some of my friends doesn’t read english nor any those langages. As I’m telling them that I found a great book, they look forward to be able to read it too, so is there a French edition scheduled for the near future ? Yes there will be a French edition published by Bragelonne. I’m told the translation is complete but haven’t seen a cover or release date yet. I’ll post any news here when I get it. Thanks Albumine, I hadn’t seen this yet. I was wondering if you’ve already started writing the third book? Or maybe you’ve already finished it or are close to finishing it? Do you already have a title for it? I’m curious to know how long the wait is for the sequel to Tower Lord, which I suspect is going to be awesome. Can you tell me when it’ll be out in germany? Can’t find a release date anywhere and i’m really waiting for it. I haven’t seen any confirmed date as yet, though I know the translation is complete. I’ll post an update here as soon as I hear anything. The German cover is quite similar to the US hardcover. The close-up and focused imaging/theme seems to be a current trend in book cover art and one I generally like, especially with this series. I am waiting, counting down, until “Tower Lord” comes out in the United States. Thank you for giving us readers (okay bad English…) information about the third book “Queen of Fire” (see Amelia’s comment above). I’m adding my thanks to Kate. This information had made my day. Only one year to wait! (“Only” being a relative term compared to other sequels that are forthcoming). I’ve just re-read/re-listened to Blood Song for the umpteenth time, and will probably do it again before Tower Lord comes out. I love that the publishing house is called HOBBIT PRESSE, And strange that the cover is identical to the US version, just drawn by another hand. Many thanks for the kind words. I have seen that Buzzfeed list which seems to have sold quite a few people on the book so I certainly have no cause for complaint. just wanted to chime in about the cover and the book. I saw the cover while paging through the publisher’s fall preview catalogue. It was quite the eye-catcher. Nice colours and composition, but it looked like that they wanted to tone down the fantasy element, without abandoning it altogether. 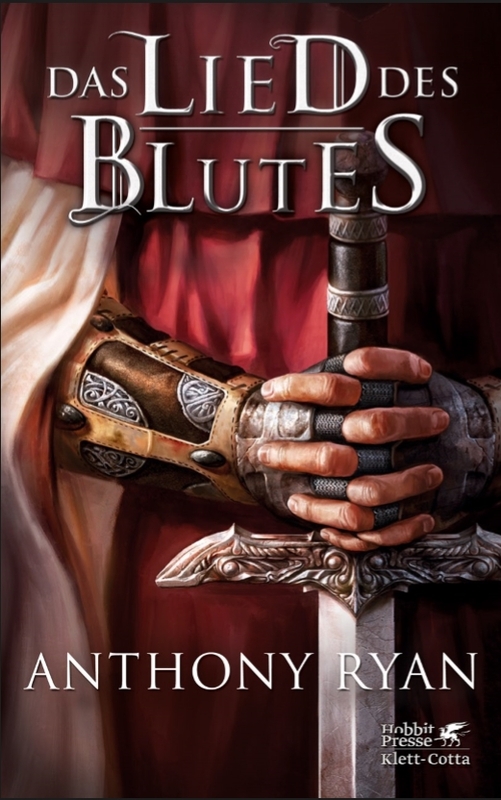 Take the sword away, replace it with a bag of coins or a bloodied rosary and you have a historical fiction cover – something about a renegade cardinal plotting his ascendance or the struggles of a renaissance cloth merchant. Still made me curious though. Despite the Game of Throne-y font. What truly sold me was a quote from one of their editors, which they included as selling point. Something like “You get a book like that only once in ten years”. There are rarely any quotes from editors in preview catalogues – I should know, I have a bit of experience in publishing. Plus, the guy probably reads dozens of manuscripts in a month, as well as potential licensing material. So, that sounded like the utmost possible praise in my ears, even if it might have been just improvised, because they couldn’t get anyone famous to recommend the book. I immediately ordered the English version and fell in love. Enjoyable writing, engaging world, interesting characters and perfectly paced. Made me quite happy. That editor didn’t exaggerate.